Global in our approach, our experts are not constrained by the limits of one location. Our international knowledge, resources, and global reach give you access to a network that will support your needs wherever they may be. 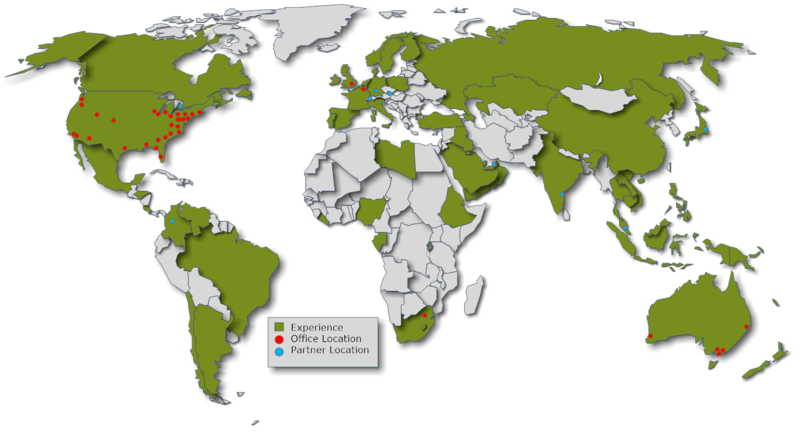 With offices located throughout the United States, Australia, the United Kingdom, Belgium, and a joint venture in South Africa, we leverage our local market expertise to help our clients navigate complex foreign regulation, and provide only the most innovative environmental solutions. Our Australian team of experienced and second-to-none consultants provides unique solutions to client projects throughout the continent, with years of regional industry experience including oil and gas, water resources, remediation, engineering, water resources and mining projects. In addition, our joint venture partnership with Pretoria-based Prime Africa enables us to combine our expertise and provide environmental, health, and safety consulting services in the African continent. This partnership utilizes the capabilities of both organizations, establishing a strong regional presence that provides environmental and economic solutions to existing and new clients in Africa, with a broad international perspective. Water and Ecological Resource Management. Together, we have completed projects in over 100 countries, ranging from due diligence, to auditing, Health and Safety, and remediation. For more information about our capabilities in Australia and Africa, please visit https://ehs-support.com.au/ and www.primeafrica.net.